I'm watching the Green Bay Packers - Cincinnati Bengals preseason football game. At the end of the first quarter Aaron Rodgers just threw a touchdown pass completing what looks to be a great first start for Rodgers. 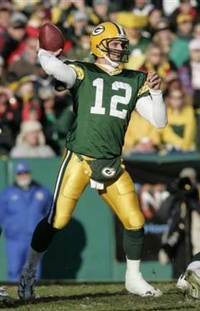 Great for Rodgers - brilliant for the Packers front office. As a "front office leader" myself, I can really identify with the Packers. Nick Dettmann of the News Dispatch said it well today, "This whole saga was mishandled by everyone involved, Favre and the Packers. However, the more I thought about it, there was just no good way to handle this situation. This was unique." The questions for those of us who put together and manage teams is this: "What do you do with a superstar? What happens when the team is known more for the personality of the star than it is known for the team? And what do you do when the superstar wants to retire, then doesn't, then wants to quit, then doesn't, then wants to play, then doesn't?" The last time I checked, football was a team sport. And the Packers... with QB Brett Favre... went 13-3 last year. They had a great year, but most of what everybody heard about was that Brett Favre had a great year. What about the other 21 players? I don't mean to take anything away from Brett. He's been a fantastic player. I've really enjoyed watching him play. And though I don't think it will happen, I hope he does well with the Jets (or the Vikings... or the fill in the blank team of the week). My point is that the Packers had to manage for the benefit of the team and for the future. They had to avoid getting sucked into the vortex of the superstar. They made the tough decision of leadership - deciding who will be playing for the next several years, despite the inevitable criticism and second guessing of Monday morning quarterbacks. The church especially is no place for staffers unsure of their calling. When faced with a player or a staffer who isn't sure they want to continue, it's important for the sake of both the team and the individual to come to a firm decision. Otherwise, like with the Packers, discouragement and disillusionment can spread like a disease throughout the organization. The Packers decided to stop the disease even though it cost them some dis - ease. There are times when the front office of churches should take the same, difficult stance. I don't know how it will turn out for the Packers. The history of new quarterbacks following legends has not been particularly promising. Not since Steve Young followed Joe Montana has the NFL seen two back to back great quarterbacks. Maybe Aaron Rodgers will be the next best example of success. But whichever way it turns out, I admire the Packers front office for making the best decision for the team... even if it means taking a few public relations hits in the meantime.